Every spring it begins: yard warriors come out of hibernation and gaze upon their lawn, preparing to begin anew their another seasonal quest for the perfect lawn. It’s a never-ending battle against dandelions, crabgrass, and even the damage done by the neighborhood dog who has designated that one special spot on the lawn as the perfect place for their daily visit. In this most recent update, a criteria section was added to give you the full access and knowledge of the best spreaders available on the market. Also, pop down to the most commonly asked questions section for further information on the purchase of your next spreader! The quest for the perfect lawn begins with the perfect grass, and if sod isn’t your thing you’re going to need a great grass seed, some fertilizer and the tools to get it where it needs to be. Let’s face it, reaching into a bag of seed or fertilizer and just tossing the stuff around your lawn isn’t going to get the job done. And that’s where a spreader comes in. It’s all about an even foundation of whatever it is you’re laying on the lawn, and here are the spreaders that are going to help to turn any lawn into the proudest patch in the neighborhood. The Scotts Turf Builder is as good as its name. This workhorse is our pick for a go-to product that will get your lawn work done efficiently, professionally and without too much of a hit to the wallet. With nearly 20 different settings it’s easy to get a perfect spread on your seed, or fertilizer, and It can also do double duty as a salt spreader during the winter. A simple but effective add-on, this technology allows you to restrict the spread of seed on the right side of the spreader. This keeps seed and fertilizer off of sidewalks, driveways or neighboring lawns. Nearly twenty different spreader settings ensure that you’re putting the exact amount of product on your lawn during the summer or driveway or sidewalk during the winter. A lot of bang for the buck here. It acts like a top end product but doesn’t cost like one. Highly rated and with lots of bells and whistles it can stand up to comparisons against some of the more expensive entries in the market. Holds 5,000 square feet of product. 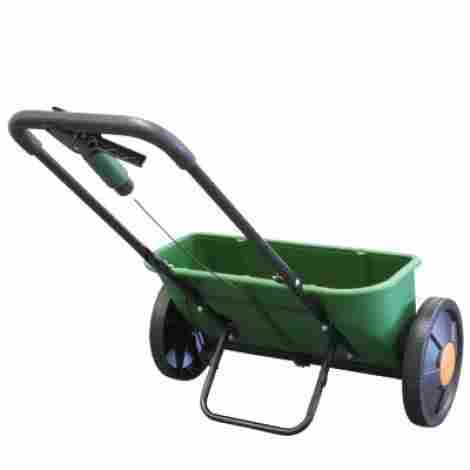 For the gardener that doesn’t want to push a cart around the lawn, this is the perfect product. The 25-pound bag holds plenty of seed and the hand operated spreader gives complete control over the amount of product that’s going on the lawn. And a well-designed shoulder strap keeps backaches at bay. The Hand-operation and high RPM gearbox along with a special automatic shutoff ensure exact control over when and where the product is going. Easy to store and easy to transport make this hand carried product a good choice for gardeners with big ideas but not so much storage space. But don’t let the small size fool you, there’s room for 25 pounds of product. Without the added cost of wheels and metal framing, this product comes in on the cheaper side. But this means all the money goes into making the Earthway work right. It’s a good value and gets the job done. Don’t let the small package fool you. There’s a fair amount going on here in this hand-held fertilizer spreader. The adjustable top actually serves as a flow adjuster making it easier to control how much fertilizer is spreading. Large easy to read measurement markers on the outside and a wide top make it easy to get to work right away. The outlet holes are large, but just like the adjustments on a larger spreader this simple to use top can adjust the amount of product you’re shaking on the lawn. This simple to use hand spreader will have little or no impact on the wallet. But considering it’s solid construction it doesn't’ feel or work like a cheap plastic product. This is what you need for big jobs. This Scotts holds enough fertilizer, seed or salt to cover 10 thousand square feet of territory. And it’s built to handle the work with a heavy duty frame and a spreader that spins out product nearly two feet in any direction. A big spreader for big jobs. 22-inch spread capacity can handle the big jobs and a hopper that can handle 10 thousand square feet of whatever needs spreading. A great choice for big yards. 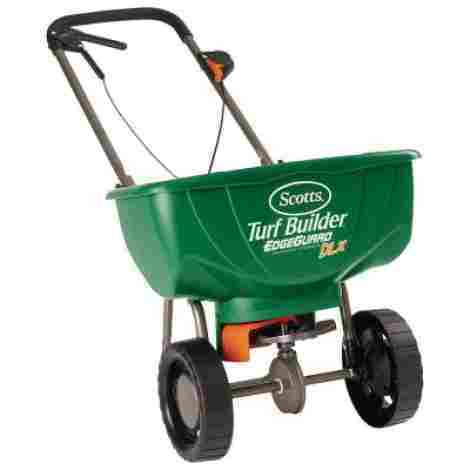 The Turf Builder Classic comes fully assembled, pre-calibrated ready to use out of the box with a heavy-duty frame to keep the high capacity hopper stable. As big hoppers go the costs put it in the mid-range, but it’s large hopper and high spread capacity make the few extra dollars worth the cost if there’s a lot of yards to cover. The Earthway is the 4-wheel drive of spreaders. Real tires, and a huge hopper that can hold up to 50 pounds of material that will cover over 13-hundred square feet of the ground. The patented EV-N-Spred system makes it easy to get an even spread of material, and allows for a quick easy shut-off. 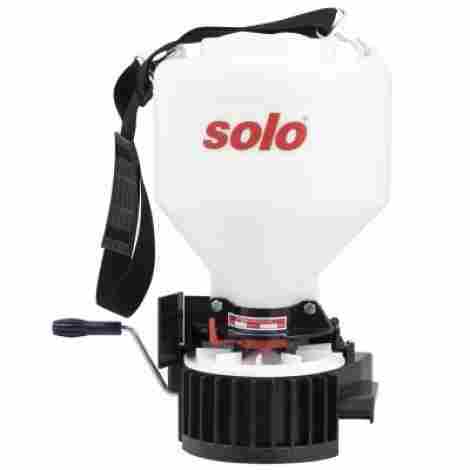 This three hole system does two things, it allows for a quick shutoff of product flow and it ensures an even flow of whatever it is you’re spreading on your lawn or sidewalk. A simple but necessary feature that breaks up clumps of fertilizer, seed or salt and does a great job a reducing jam in the spreader and inhibiting the shut-off system. It’s not cheap, but the sturdy construction, pneumatic tires and huge capacity set this product apart from the cheaper entries on our list. An anti-clumping debris screen, heavy duty construction and the ability to cover a lot of ground are the justifications for the Earthways price tag. The second entry in our shoulder mounted hand cranked spreaders. The Solo has a 20-pound capacity but a comfortable shoulder strap makes lugging that kind of a more comfortable proposition. It also has a large top opening which makes the filling and cleaning a lot easier than some of its competitors. It also looks cool, and let’s face it, that’s hard to find in a spreader. A unique and thoughtful extra. Fertilizer can be nasty stuff and since hand-held spreaders operate fairly close to your face, keeping dust and flying excess out of your eyes and nose with a cap can make a big difference when it comes to comfort while working in the yard. A strong polystyrene hopper that will stand up to the elements along with a fully enclosed stainless steel gearbox makes this a spread that will last for the long haul. This is a great value but less money, in this case, doesn’t mean cheap parts and shoddy construction. Stainless steel and thick polystyrene make this a spreader that will stand the test of time and take the worst that weather and hard work can throw at it. 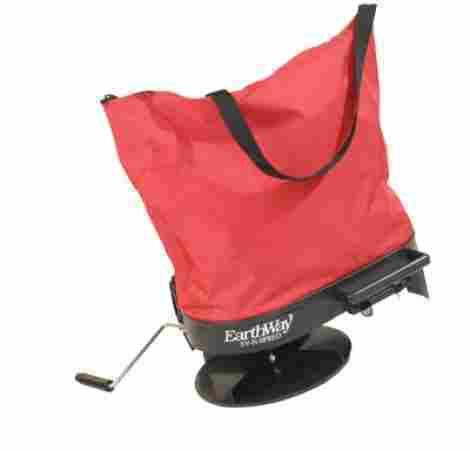 Earthway’s entry into the shoulder-mounted spreader category is a solid product for the homeowner who just doesn’t feel like pushing one more wheeled contraption around the lawn. This shoulder-mounted spreader can hold up to 40 pounds of product and comes with a rain cover and easy to use shut off and spread controls for even distribution. 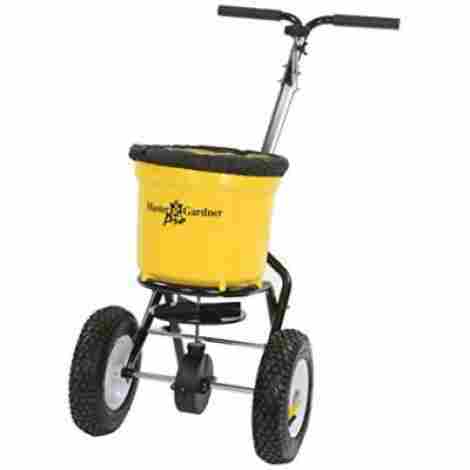 This sturdy spreader can hold about 40 pounds of product, and that’s a lot for shoulder mounted product. But well-designed shoulder straps help distribute the weight and not make carrying this spreader too much of a burden. Well-designed gearbox and easy to use controls mean this will work with all kinds of seeds, fertilizer or de-icer seamlessly. Direction controls also allow the user to focus on special areas in a 180- degree arc. At the high end of shoulder mounted spreaders but if you can handle a 50-pound weight this spreader allows users to get a lot more done before having to head back to the garage to reload. Well designed direction controls and access to all areas of the yard also make this a solid entry in the shoulder mounted spreader market. 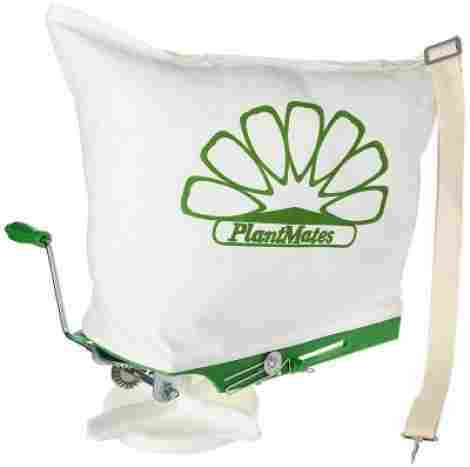 Simple, cheap and effective are the trifecta of adjectives that come to mind when describing the Plantmates spreader. It is shoulder mounted so it’s particularly helpful on uneven, rough or hilly landscapes. It holds 25 pounds of product which is enough to get the job done but light enough to not be too much of a burden. The hopper is a canvas bag, an interesting departure from the avalanche of plastic found in most lawn products so it’s a nice entry for anyone worried about the planet as well as their lawn. A simple metal hand crank controls the speed and allows for easy shut-off, and a plastic and metal tab that pulls towards the user makes it easy to control the flow rate. The hopper is made of sturdy canvas with a zip-top, and the strap is made of a man-made fiber and the parts are mostly metal making this the choice for someone who’s trying to manage their environmental footprint. One of the cheapest entries on the list the Plantmates spreader has a lot going for it despite its cheap price tag. Sturdy metal construction and a focus on using less plastic make this a great choice for the earth-conscious homeowner. 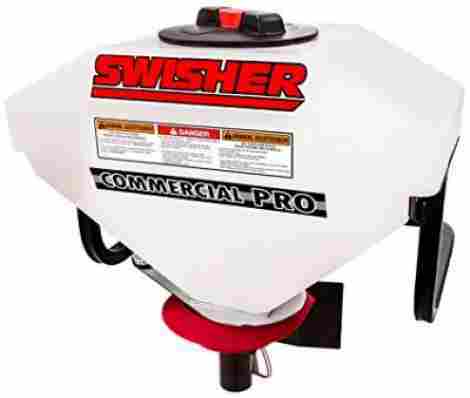 A special entry for yard warriors who need a fertilizer spreader to mount on the back of their riding mower or ATV, the Swisher is a high capacity spreader that gets the job done. Its giant hopper holds up to 150 pounds of product and it can spread anything thrown at it. It’s got a universal mount that lets it fit onto almost anything and even though it’s mounted on your ATV there’s a flow controller that is easy to reach and use even while driving. Easy to use slide bars ensure that this spreader will find a home onto whatever mounted ATV is moving around the lawn. And once it’s attached it’s built to allow users to control the flow, and shut off controls while driving. 150 pounds of product is a lot and the sealed lid allows the Swisher to do double duty as a product storage device as well as a spreader to help make room in a cramped garage. A big spreader for big jobs this is a high end product with dollar signs to match. But for commercial or constant use, or if there’s just a huge amount of yard to cover, an investment in a high capacity, high end spreader like the Swisher makes sense. A sturdy workhorse the Master Gardner spreader has a few special features like real tires, and a 50-pound capacity that makes it a solid entry into our list. It’s adjustable and can easily handle both huge commercial jobs to small yards. Real wheels are an added bonus, and the rain shield helps keep products dry if it decides to rain on any yard warriors lawn care parade. Sturdy tires and simple construction make this a spreader to stand the test of time. Its minimal construction makes the controls intuitive and easy to operate. A nice addition, the removable mesh screen helps stop clumps of product from jamming the spreader, but making it easily removable just adds more flexibility and customization. In the mid-range on high-end spreaders. You’ll lay out a bit of cast for this product but its sturdy construction makes it a long-term purchase and it’s reliability make it a good investment and likely to stick around for a long time. The perfect lawn is a dream that’s sometimes so difficult to realize it just ends up an unchecked box on the bucket list of life. To make the dream real a fertilizer spread is probably going to have to make its way onto your path towards yard perfection. Lawn care products should definitely fall into the “set it and forget it” category and all too often spreaders can be all about the jams, the settings and uneven spreading,a dn that’s a great way to throw a hitch in a day of yard work. Our list will hopefully keep you moving and help you move towards the kind of lawn that will have neighbors stopping by for advice. With the large variety of spreaders on the market, today finding the right one for the job is a critical part of choosing the best product for your needs. In order to ensure we could find the best spreader for your yard’s needs, I selected products that would be capable of spreading over the smallest and even some of the larger yards. The spreaders on this list are capable of spreading seed or fertilizer between 2,500 and 18,000 square feet. This area of effect will allow you to cover anywhere from a quarter acre up to a full acre of land making them nearly ideal for household or light commercial use. With some of these spreaders holding in excess of 45 pounds of seed or fertilizer it is important that you are capable of easily manipulating the spreader without having to exert a substantial amount of force. The way a spreader is designed can go a long way in assisting your handling of a fully loaded spreader. The use of rubber wheels, steel arm handles, and sometimes even a breaking handle will greatly increase the control you have over the spreader during its operation. Some of these spreaders have all of those wonderful additions while others are intended for either handheld use or can be mounted much like a backpack would. The amount of seed or fertilizer that a spreader can hold will speak volumes about the spreader and will determine a multitude of different aspects. The amount of seed inside the spreader will determine the size of the area in which you can effectively cover before needing to refill your spreader. 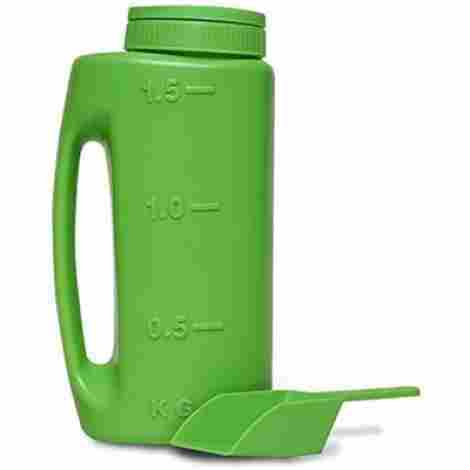 While a larger capacity will mean less refilling it will also mean a little more work as you will have to exert more force to push the spreader. Additionally, this larger capacity will require a moderate degree of effort to fill the spreader and some seed or fertilizer bags can be quite heavy. In order to accommodate many different needs, we selected spreaders that had both a larger and a smaller capacity so you can choose based on your specific needs. When choosing a spreader you will need to determine the rough area in which you need seed and consider how you will access the area. A wheeled spreader will need to be able to roll over the area without impediments that can affect the distribution. Handheld spreaders, however, are more accommodating to tight spaces or smaller areas in which a full-sized spreader may not be capable of covering. After you’ve determined the area you will need to estimate the amount of seed or fertilizer you will need for the area. Wheeled spreaders can generally hold a substantially higher amount of seed or fertilizer and are well suited to larger areas. Handheld spreaders usually reach a 20-pound capacity and this added weight makes them better suited to smaller jobs. We included both options on this list and rated them based on their capacity. A key performance trait of any spreader is how evenly it can distribute the seed or fertilizer. Many fertilizers are very particular about the distribution as too much in a single area can cause your soil to become “hot”. This means that there are way more nutrients than your plant life can reasonably intake and it can cause your plants to go into shock and blister the leaves. Similarly, should you be planting new grass or patching a dead spot the distribution of the grass is very noticeable after growth and the change in density is very noticeable which can be counter-intuitive to the original purpose? Many of these spreaders have a control panel or use another drop method that will funnel the seed or fertilizer in a way that distributes it evenly ensuring to maintain the density you desire. One way these spreaders maintain their reliability is the method in which they spread the fertilizer or seed you intend to use. There are three main spreader types and one is really just you using your hand and a scooper to hand spread the seeds and this is best used in smaller or more compact areas. Many of these spreaders use the rotary spreader and they are better at applying your fertilizer or seed to a larger and flat area. Others use a drop method, and these spreaders simply allow your desired applicant to fall through the base as the wheels rotate a feed that ensures you have an even spread. The drop feeders work well in uneven terrain and are suited for moderately sized areas. Equally as important as where you want to use your spreader is where you don’t want to use your spreader. Should you be spreading fertilizer being conscience of the nutrient requirements of your plants is critical to success. Generally, most plants need the same three basic nutrients to ensure they are properly fed ( Nitrogen, Phosphorus, and Potassium ) and overexposure of these nutrients can be harmful. Furthermore, should you have any plant life that requires a different ratio of these nutrients than another plant you will need to be able to accurately spread your fertilizer? A few of the spreaders we selected use a guard that is adjustable and will allow you to control the direction of your spread. While it may not seem like a very common occurrence the weight of your spread and uneven terrain can lead to your spreader becoming damaged. Generally, this happens when a wheel is misaligned or your spreader becomes jammed. Regardless of how it happens to be able to easily replace a part on your spreader can save you time and money and keep you from having to purchase another spreader. Nearly all of the spreaders we selected did have an outlet in which you can find replacement parts to keep your spreader running smoothly. Part of using a spreader is being able to calibrate the flow of your spread. This will make sure your spread is applied in an even manner and will work to keep your spreader from clogging. Additionally, the type of fertilizer or seed will determine how you calibrate your spreader as each one has a unique size, shape, and weight. Calibrating you spreader is a multi-step process and will need to be done each time you swap fertilizers or seeds. Many of the spreaders on this last use a quick calibration panel or another way to make the simple and small adjustments you will need in order to ensure you’re getting even distribution. Older spreaders or ones that use a poor design would generally start spreading your seed or fertilizer the moment you start pushing your spreader. While it did the job you often will experience some waste this way unless you begin in the exact position you intended to start. That means you either would have had to carry your potentially heavy bag to your spreader or push your spreader there and seed or fertilize areas you may not have intended to. Newer models and the ones that are quite well designed now use an application handle that will prevent your spreader from dropping seed or fertilizer until you activate the handle and many on this list use this valuable addition. A major part of using a spreader is determining the effective swath that your spreader possess. The swath is the area of effectiveness that is measured and established on each side of the spreader then combined into the total area of coverage. Knowing your swath will help you to determine the spacing you will want to use and help you to choose a spreader that will work best with the area in which you intend to use the spreader. Of these spreaders, the most common is a 180-degree swath and a 10-foot area of effect. While this varies from product to product and will change depending on the seed or fertilizer, testing the swath yourself is the best way to make this determination. Whether you’re working on a budget or just prefer the products you buy to be priced reasonably we took the time to do a comprehensive cost analysis across these different spreaders to determine which products had the best value. We started by identifying the key traits of each spreader and took into account any additional products or potential bundles that were included. With each those that came in at a lower price but had more features or additional items were placed higher than those with a higher cost and fewer features. Like nearly anything you could potentially build, spreaders included, the foundation is a critical point in the structural integrity. These spreaders use either rubber or plastic wheels and each has its own unique set of advantages and disadvantages. Rubber wheels provide exceptional control and will not be affected by the presence of light dew or another water contact. However, rubber wheels also need to be refilled with air and can be popped should a sharp item penetrate their membrane. Plastic wheels are highly durable and will not be affected by sharp objects or require any out of the ordinary maintenance. Unlike rubber wheels, however, the plastic options operate poorly with the presence of water and they are more difficult to control. We chose to include a few that used both types as each would be better suited for different scenarios. Year in and year out these spreaders can get some mileage and part of picking a durable product is determining the products used in its development. Of the wheeled spreaders, we tried to select products that used a more durable plastic trough that would be capable of withstanding the weight of your spread. For the handles, we picked spreaders that used steel or other highly durable metal that wouldn’t bend or break during use with a heavier load. The handheld and carrying models we selected spreaders that used straps and bands that will allow you to hold them much like you would a backpack and wouldn’t be capable of holding more than 20 pounds of spread. Part of keeping a spreader in proper working order is performing regular maintenance on it to ensure its running smoothly. While this takes extra time it’s one of the best ways to ensure your purchase will last you for some time to come. Generally, the maintenance on these spreaders is quite simple and usually entails clearing the trough of leftover spread and refilling rubber tires. Additionally, we tried to identify any upkeep cost these spreaders could potentially cause and found that aside from buying the spread and unforeseen damages there is little to no upkeep cost associated with these spreaders. When using fertilizer often times it will tend to clump up and this can and will cause your spreader to jam. Should you not notice that your spreader is jammed early enough this jam can even damage your spreader. 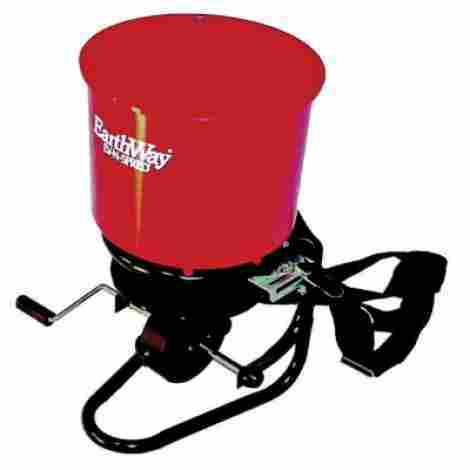 As a common issue, many companies introduced an agitator that will work to break down your fertilizer prior to it funneling out to your rotary or other distributors. Many of the spreaders we selected to use an agitator and should you be experiencing clumping issues those spreaders will likely become your new prized possession. First time user or annual expert the ease of use was a very important aspect in which we made a focal point when selecting these products. Spreaders come in all shapes and sizes and are even used in large-scale farming operations and those can have multi-functions and can be much like operating heavy machinery. While these aren’t on this scale some of the smaller spreaders can be confusing to use. Each of the spreaders we selected is relatively simple to use and with a little time and effort can be mastered by any user. One of the features we needed to balance perfectly was the weight of these products. Trough style wheeled spreaders in particular need to be lightweight because should you have excess fertilizer or seed more commonly than not the only way to save your expensive spread is generally to upend the spreader. The handheld and strapped models also needed to be lightweight because the spread you use can be quite heavy and you will feel each extra pound with every step you take. The spreaders we included weighed between 1 and 27 pounds. The heavier spreader would be better suited for commercial use. Some of the spreaders on this list are capable of maintaining a swath of up to 16 feet. While this is an amazing accomplishment this may not be a great size for your standard quarter acre lawn and a smaller alternative size would probably be the better bet. Perhaps you like the model however and want the same functionality in a smaller package. A few of the spreaders we chose do have different size options which ensure you can get the same performance on a smaller scale. A huge part of what makes a great spreader is finding one that is produced by a company that lives by its product. Aside from including multiple features and a diverse line of products the best manufacturers stand by the craftsmanship employed to make the best possible product. A manufacturer’s warranty speaks volumes about the quality of the product and will surely help to ensure you have the highest level of satisfaction when purchasing a spreader. Many of the spreaders we selected use a “No Quibble” money back guarantee and will refund you no matter the reason should you be unhappy with your spreader. So if these are specific to an item and not the entire company it is critical that you read all disclosures before making a final decision. Q: Can these spreaders be used with salt or other non-lawn related purposes? A: This varies from model to model but is generally included in the description of each product. Yes, however, many of these spreaders do in fact support the use of salt, sand, or other spread you may have need of. Q: What is the maximum capacity rating for these spreaders? A: As a focal point during our research we selected these spreaders with the intention of diversifying the carrying capacity giving you the option to find on that fits your need. Each of these spreaders varies in capacity between as little as 10 pounds and up to 50 pounds. Q: How wide are these spreaders? A: The smaller handheld and carried spreaders are much smaller and have a width that is 10” and lower. The larger spreaders vary in size but are between 10” and up to 26”. 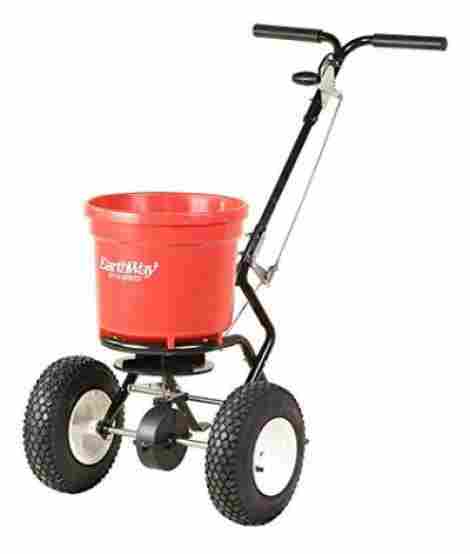 Q: How do these spreaders adjust to narrow lawn areas? A: Seldom are our yards perfectly aligned and square in every direction and many companies are aware of that. Some of the spreaders on this list use a plastic shroud that will direct the flow of your spread and can be adjusted based on your needs. Others will require you to sweep the excess spread into your area. A: Some of the spreaders on this list are bigger and bulky and in order to make shipping easier you will need to assemble some of the spreaders on this list. Q: How long are the straps on the strapped spreaders? A: With the carried spreaders already posing their own challenges we attempted to make sizing the last concern you would have. Each of the carried spreaders on this list uses an adjustable strap that can be resized for your specific needs. Q: Do these spreaders use seed adjustment? A: The size of seeds, fertilizer, or other items you may need spread over an area will vary drastically. Many of the spreaders we selected do have the ability to adjust in order to accommodate your specific seeds or other spread. Q: Do the handles on any of these models fold? A: With storage being a concern of most users many of these products do fold for easier storage however this varies from spreader to spreader so you will want to ensure yours is capable of doing so.